What happens when you let me loose with dictation…! It’s been a while hasn’t it? Which as always is not to say that I’ve stopped doing things, just that I’m trying to do everything at once. I found a couple of new groups on Facebook which are full of the most exciting and innovative information on how best to optimise your time as a writer and the best ways to write well and quickly, and then to produce well and quickly. To this end I am teaching myself dictation. To readers this might sound like a slightly random thing to do, but those of you who have already dabbled in it will probably know how much faster you can generate your words by speaking them rather than typing them. Case in point, my typing speed is not too bad – about 1500 words per hour – and I can type for several hours at a time, given the chance – but when do I get the chance? I don’t, is the quick answer. If I dictate, my first draft is considerably rougher, but in the same amount of time I can currently generate 2500 words, and that’s just with the generic office variant – I haven’t got the dedicated software yet. Speaking to the others in my Facebook groups, using Dragon many of them are able to get down 5 to 7000 words in one hour alone. Obviously this needs rather more editing that if you were to sit down and type it, however it does mean that the first draft is very much quicker to get onto the page. Oddly it seems to be much less tiring to dictate for three hours flat – even with the corrections as you go – than it is to type for those same three hours. So yes, it does need more editing, with the software I’m currently using. But if I get to the point where I can afford proper software and a microphone, this will be much less of an issue, and in the meantime it means that I can finish the first draft much more quickly than I can whilst typing. A second usefulness of dictation is that so long as I have Word open on my phone, at any point at work where I’m walking between rooms, so long as I have my microphone with me, I can do a five minute sprint on the latest story. This really maximises my writing time, as with five or six of these I can get 1500 to 2000 words down just in time just would otherwise be spent on the stairs or in the corridor. How cool is that?! I also plan to rename and recover Song of the Ice Lord as at the moment I don’t think the cover I’m using (which I love dearly) actually reflects the genre of the book itself. Further, there is an issue since the success of Game of Thrones, which is that if you search Song of the Ice Lord, what you actually find is four pages of results for A Song of Ice and Fire instead. Consequently I have finally given in and decided to both rename and recover the book. I am considering cutting the three tales which are told by characters in the story. One of these has not yet been published separately, but is on the list to do next. The other two are already available separately. I am open to discussion on this, but I suspect they slow down the main narrative and would be better cut from Song and just referenced, remaining available as standalones. If anyone has read Song, what you think? Did you like the stories as separate episodes within the main book, or do you think the story would flow more smoothly if it is not interrupted? In the meantime, I am inputting the corrections to Flight. This came back from the editors sometime ago, and at that time I thought the chronology needed fixing so did a lot of work on it. Frustratingly, after having done so I discovered that one of my initial assumptions was incorrect, and the original chronology would have worked perfectly well. Then the file got corrupted so I had to start over from scratch. Arghh! Because of the rewrites the editor requested for Flight, it now overlaps and makes a nonsense of the chronology of On Dark Shores 1&2. So in order to resolve this, I need to cut all the books into one file, sort out one overarching chronology, put all the things I have written so far into order, and very probably then thin out some of the characters and the smaller plot strands so that it all makes sense as one streamlined narrative. Yes, this is a lot of work. Yes, I am plugging away at it. No, it will not be a quick or slight undertaking. Yes, when it is all done I still need to finish the last few thousand words of the trilogy, including the final crisis and working out where the story will go afterwards. It is my intention that this will be a trilogy that comes to an end of sorts, but with a bit of luck there will be enough interest to justify the next trilogy! So the saga of On Dark Shores continues without any actual resolution – as per usual. Sigh! So as ever, progress is happening. It’s even possible that I might have a new release for you in the Dragon series of shorts, due over the next couple of months. If I can use the short stories to raise a bit of money for the covers, Holly 3 should be ready to go soon, and Holly 4 is just getting fun, so I might even have two series finished which would be fab! It’s my hope to get both of these out in their entirety by the end of this year; however as you know I have a Douglas Adams like attitude to deadlines… Not necessarily from choice! It’s always a question of just getting to the end of the next bit, just keeping on learning, keeping on writing, keeping on editing, trying out new things as much as possible, trying to stay on the curve of the wave in terms of technology, while still actually publishing even just a short story once in a while! Anyway. Obviously the blog is suffering a bit because I am working hard on everything else, but if in doubt you can always find me on Facebook, and if you follow the On Dark Shores Page on Facebook, I will link there to my other new undertaking in the format of Facebook Live broadcasts! and the second is one where I show you a book of which I was particularly fond as a child, with all my favourite fairytales in, some rather beautiful pictures, and some pretty dubious colouring in by one of my sisters! Ah, those 80s felt tip pens-we had a huge packet of them. I remember it well. In any case, I am trying to put a broadcast up every couple of weeks although it takes a bit of doing to work out what to actually say, so again, if you have any questions or things you would like to hear about please say so! It’s always a bit weird seeing yourself on video or hearing the sound of your own voice even, but as I do more of it it’s getting easier, so hopefully I’ll start getting good at that. All constructive criticism gratefully received though! Anyhow, dictating this so it’s got quite long quite quickly. Oops! But you see why I am hopeful that future books can be generated rather more quickly than previously? Har. Posts overdue, due to my apparent inability to tell the diff between the Preview button and the actual Publish one…. I might be a bit tired but plus side, it’s a while since I caught myself putting the Fairy Liquid in the fridge so on balance I’m classing it as “weary” rather than gibberingly knackered. And my autocorrect is off on one today so it was surprisingly complicated to actually get that sentence right….! So. Currently sitting on the sofa watching the dog, who is lying upside down and wagging in his sleep. Being a Lurcher this is a rare sign of approval so I’d like to think he was dreaming about the pack humans coming home, though in all fairness he tends to greet us with mild approval. The Sainsburys delivery man, on the other hand, virtually gets a ticker tape parade ever since the time they substituted chicken flavoured treats for his Dentastix. I was just explaining that Dog is not a big fan of chicken when he slunk up between us, delicately poked his snout into the carrier bag, retrieved the packet of treats and slunk away to his bed where he spent some time fiddling with the packaging. Then he brought it back, dropped it at my feet, nudged me and stared pointedly at it. The Sainsburys man said “It’s terrible when they’re so fussy,” (chortling to himself). So we agreed that it might perhaps be an acceptable swap on this occasion and Dog has greeted him with glee ever since…. Returning to the point, however! Progress. It’s about to slow because I’m cutting back on all the late night work I do after OH has gone to bed. This is mostly because I can only manage 4h sleep a night for so long before I start walking into things, and my day job needs a certain level of alertness right now, so trying to keep it low level and ongoing at sustainable levels. Yep, it’s exactly as frustrating as it sounds! However. Currently moving towards the last part of a fairly substantial edit on Wolf book 1 which seems reasonably settled around 118k words, so will probably end up nearer 110k after the editors get their scalpels on it. I’m currently thinking that as this is the most standalone of the lot, getting this one out separately might not be a bad thing provided I keep writing the others which will need to come out at regular intervals. Also a few last edits to put in place and I might have Holly & the Ivy coming up to being ready – anyone not already on the ARC list who wants to be, give me a shout. The cover is now done and with a bit of luck I’ll be able to do you a “process blog” like the one for Sprig. Next time, eh? So. Onwards! Dog to walk one last time for the evening and then I’m calling it a day. Have a good evenin, all…. Cover Reveal for the Locket – & WGP admin will never be the same again! I trust you’re all getting into the festive spirit and happily ploughing your way through ladles of eggnog and oodles of books. Just wanted to introduce myself as the newest member of the Weasel Green Press team. I’ll be helping JA with sundry admin-y type things, a little bit of proofreading and sprucing up our online presence during the early part of 2017 so that she can concentrate on what she does best, doting on hubby and lurcher writing stories that entertain, whisk us off to imaginary lands and generally keep us on the edges of our seats. I hope a few of you at least find it in your virtual stockings come Christmas morning. In the new year it will be all systems go with Sprig of Holly sequel, The Holly & the Ivy which we hope to release early in January so do look out for those. A little bit about me – my reading habits tend towards the classics, modern American literature, anything that rips the old heart out and the giants of fantasy and sci-fi such as Tolkien and Asimov. I’m also oddly well read in WWII novels on account of stealing most of my reading matter from my big brother who is a bit of a WWII boffin. But enough about me. I hope you all receive the books you’re pining for this Christmas and get enough down time to breathe a sigh of relief at the close of this rather singular year whilst indulging in a new work or returning to an old favourite. Have a good one folks and I wish you all an enlightening and peaceful new year. I won’t write a great Hallowe’en spiel now as this is just a quickie while I have a moment. “Mother of the Shantar” (aka Book 3) has been playing up in a major fashion, and earlier in the year I realised that of the 85k words I then had, fully 75k were backstory and should be cut out. (OUCH!) It was quite a good bit though, and as Book 3 is still resolutely refusing to fit together, I set that aside for a bit to polish up the backstory. The result of that is “Flight from Shantar”, which chronologically speaking, is the preamble to Vansel and Jack’s arrival in Scarlock, and tells of Alaric’s efforts to bring the Mother over the Shantar border. This is nearing completion. The second bit of backstory that has been cut and expanded is “Song of the Ice Lord” which tells of the events nearly three thousand years before ODS, when the Ice Lord first came into Nereia’s world, and the terrible war he unleashed. I have just finished writing it into a more rounded tale, and have started on the edits. I will be surprised if we manage to get it on the shelves before Christmas, and I shan’t hurry it in order to make that deadline, but it shouldn’t be so very many months before it is available, so watch this space. In the meantime, November is dedicated to shaking Book 3 into submission, as you’ve all been waiting far too long for it, and frankly, so have I! This year has been madness, but I am hoping, just faintly, that next year there might be a little more free time. If there is, watch out – I can tell you that for Nereia, the chase has only just begun, and as Dr Seuss would say, “Oh, the places she’ll go!” It’s going to take about six more books to get there, at this rate, so I hope you like long, intricate tales as much as I do…. But enough chattering, more writing, I hear you say – this book isn’t going to write itself! And of course you’re quite correct, so it’s back to the batcave for me. In the meantime, enjoy your Hallowe’en / Bonfire Night / Thanksgiving / Samhain / other! Back soon, I hope, with all sorts to report! PS: While you’re waiting, if you’ve ever wondered what Nereia’s childhood was like, have a look in “Christmas Lites 2” – least year I contributed a tale from when she was six years old, and the wonderful Yule party at which she first met her Godmother. Besides, the rest of the book is so entertaining, I challenge you not to laugh / cry / love it! This is the news from the WGP! Book 3 of ODS is currently at 30k words and moving on slowly. Currently aiming to make it somewhere between 100k-150k depending on where the nearest stopping place is in order to allow for 10% attrition in editing and still leave you with the tome you’ve been requesting. Parallels novella “Flight from Shantar” is currently at the editor and awaiting his scalpel. Expect exclamations of “Ouch” and “Oooyah!” over the next couple of weeks when I get it back! Parallels alleged-novella “Song of the Ice Lord” is currently mostly on hold while I get on with Book3, but is currently approaching 70k in length and does good duty when I’ve hit a stumbling block on Book 3! Ultimate length will be (as long as it takes) minus (editing scalpellage). And yes that is a word because I just made it up. Job: utterly manic for the next two months. Hoping to have a little more free time after that. Houses: now shortlisting. Hoping to put in an offer in the next couple of weeks and move August / September time (expect a writing hiatus again while that’s happening; hopefully timing will be right to be editing “Song” then). EXCITING NEWS – WGP author Jo Edwards of “Work-Wife Balance” fame is putting the final touches to her sequel, “Potbound”. Watch out for this, which should be hitting cyberspace any time soon! And finally – insert your favourite picture of a funny cat here. Another check-in, briefly, because I’m saving all my word-time for writing! As you know, I’m currently working on two novellas at once as well as Book 3… well, the first edit (the one I do) is now done on “Flight from Shantar” and it’s ready to go off to my editor. Why am I working on this before Book 3, you ask (and a few of you have done)? Flight was originally written to be one of the ODS series, and the events in it happen concurrently with the first books; but to put it in the main series brings the timeline to a juddering halt. This is why this section was cut from Book 3 – but at the same time it’s a story which readers might like to hear; and so it’s going into the Parallels series. That’s it for now, but just an update so you know I haven’t forgotten you all! Well that’s a bit odd…. Oi, WordPress, what’s going on?! I just wrote a long post with the latest updates and WordPress just ate it – it’s not even in Drafts! Grrr…. b) Snow. Oooh, cold! Big drifts in this neck of the world, most spectacular. c) Busy! Lots of moving house and changing jobs of late but hopefully a quiet spell is due so a bit of editing is happening in spare moments. What editing? Initial corrections on the bit cut from Book 3, which will be released as a separate in the Parallels series (current working title Flight from Shantar, but that’s a bit clunky I think. Thoughts, anyone?). When this is sent off to my excellent word-surgeon, last lot of corrections and inputs to be done for another short in the Parallels series, a bit of back story called Song of the Ice Lord at the current time. This is nearly done, and will then go to the formatter and (if enough remains for a paperback) to Regina for a cover as well. d) Book 3 – still at 15k but ongoing plotting and planning means that soon as I’ve finished with the others, it should go quite quickly if nothing else happens to eat up my writing time. Watch this space. Anyhow, going to sulk now as my first version was MUCH better and more eloquently written than this one. Not impressed, WordPress! Paperback – prepare for Launch! Anyone in the vicinity of London and fancy coming to a launch party at the end of the month?!! Details still tbc – there will be a couple of other authors there, possibly a giveaway or two and quite probably much going to the bar and chatting. If I can get them sorted in time, there might quite probably be some rather tremendous bookmarks to be had…fingers crossed! We’re not going to book anything, just find somewhere there’s a bar, a bit of space, and they might not mind us putting posters on the wall. It will be somewhere central – the bars on Southbank are in with a chance, or if not, somewhere equally central and within reach of public transport. More as I know it, but readers, reviewers, authors, all are welcome to come – and authors, if you want to fetch a signed copy or some bookmarks to distribute or anything of that sort, please do – the more the merrier! If you’d like to be kept up to date with details, please email me at jaclement.ondarkshores@gmail.com and that will give me some idea of how many potentially might appear. (At the moment it’s up to about 20, so enough to have a good laugh methinks). Currently looking at Thursday 25th Oct, and it will probably be any time from 6 onwards… would be great to see you there! And of what are we celebrating the launch? Finally! 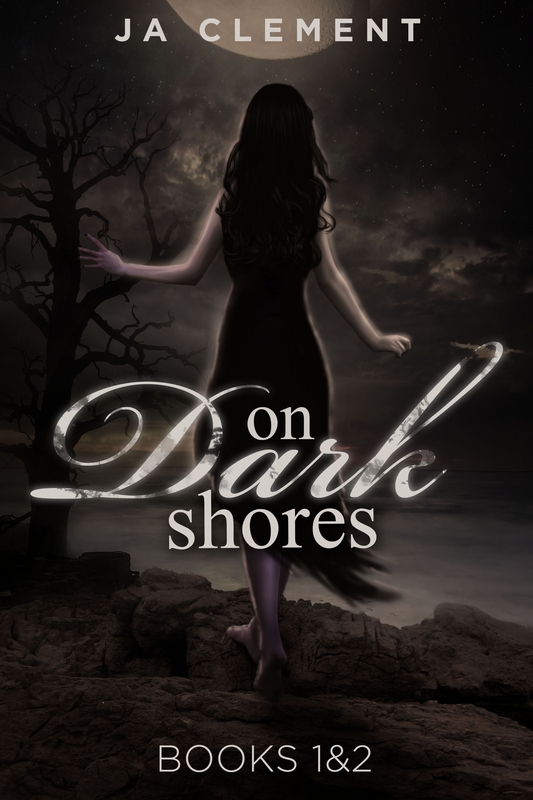 Cover Reveal – On Dark Shores 1&2 Paperback Edition! As you know, now that ODS 1 & 2 are both out, I’m about to release the paperback. It’s currently in formatting and should be ready to go to the printers quite soon, but in the meantime, I have a new cover to show you and in all honesty I’m too excited to wait any longer! It was done by the inimitable Regina Wamba of Mae I Design, and below you’ll find her guestpost. I will say, when you’ve read it, do go and look at her design gallery – there are such beautiful pictures and book covers there that I keep having to go back and see if she’s got any new ones up!! One-sentence biog: I don’t blog. You have to be able to write to blog. No bueno here! What is the first picture you remember making? Horsies… I loved horsies. EVERYTHING was horsie related. And because it’s been a long time… I will say it again. Horsie. When did you know you wanted to do art for a living? Gah… FOREVER. I used to watch Bob Ross and think… now this is what I want to do. Now, not technically am I doing what bob did, but hey… I love creating. He made some great trees you know? When you draw / make art, do you have a routine or habit? Not really. I usually just find something that sparks a thought, which sparks pictures, which sparks me doing something creative. I have to have some sort of outlet with me at all times, otherwise scraps of paper get used as my canvas and that isn’t really all that efficient. What kicks off the picture? Do you plan it or do you start with a line and see what it looks like? When you do bookcovers, what in the summary tends to catch your attention? Sometimes the whole thing, but usually I have to read a bit more than a summary to get a “FEEL” for the cover…. I want to express your words in image format… It’s important that I get it right. Of your various artistic endeavours, which is your favourite? Because I live in a teenytinylittlepuny house… I don’t have the space for a studio, so I don’t get to do paintings and such as often. But when I do, I enjoy probably drawing first, and painting second. And then my other favorite art form is photography. Boy… that is just FUN… I love all types of art! When you make covers without a story, is that a different artistic process from when you have a summary to work from? Yes, basically it is more free rein. I get something small to make something big. BUT I get more vivid imagery when I read more. Do you have a favourite cover or picture that you’ve done? Do you read much, and if so what? YES. I love to read! Love Love Love… I love historical romance, new adult and young adult paranormal. I love anything paranormal. But I also enjoy a good book if it makes me think. I have a Nook and and iPad! Have you read and enjoyed any other indie authors? What are your views on self-publishing / e-books? I really only read on an e-reader, so all I really have are ebooks. 🙂 I love how much control authors have over their books… but I wish that it was easier for them too! There are tons of VERY VERY talented individuals! So there we have it! Did you like my cover? What do you think? Thanks to Regina for her splendid cover and for guesting here – and to the rest of you, watch this space for news of the paperback, and if you’d like to be involved in the launch party (and I’m intending to have giveaways and prizes and all sorts), drop me a line….